Fawkner residents rely on the Upfield train line as the primary public transport link into the city. Residents and others from up and down the Upfield line attended a rally on Saturday in Bonwick Street to push for more trains, track duplication and upgrade of the Upfield line. 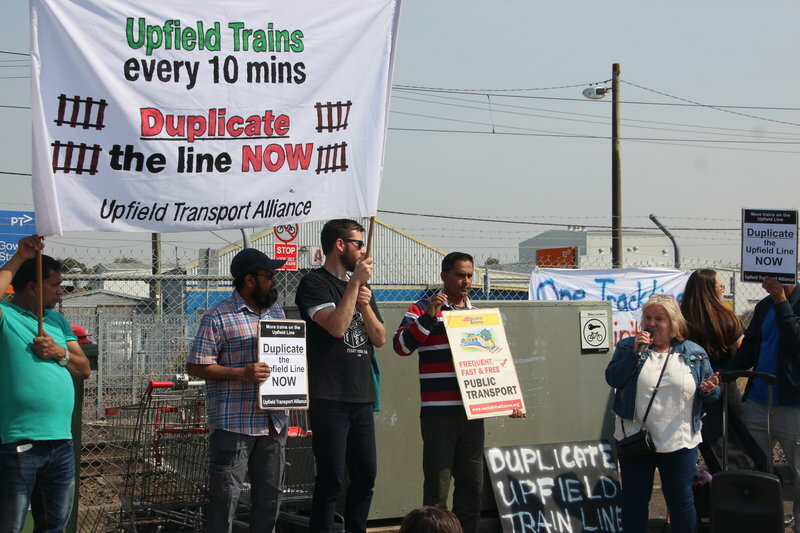 See full report (including speeches) at the Upfield Transport Alliance: Duplicate the Upfield Line needs to be a priority says Fawkner Rally. Public Transport Victoria and Level Crossing Removal Authority have failed to explain why trains will terminate at Coburg Station instead of Gowrie Station. Due to Level Crossing Removal activity at Camp Road trains will terminate at Coburg station from 8.30pm Thursday 26 October to the last service on Monday 30 October. A bus service from Coburg to Upfield will replace the train. This disruption will be repeated during November and December. Unfortunately buses aren’t as friendly for wheelchair users, or for cyclists who use the train. What about people who use mobility scooters? Will they be catered for? These people are particularly negatively affected, as well as regular users of Batman, Merlynston, Fawkner and Gowrie stations. I don’t see why trains can’t terminate at Gowrie, where there are points north of the station before the M80 bridge allowing a train to go beyond the station then come back heading to the city. Moreland Council have announced a Survey on extending Sydney Road tram through Fawkner. This is gratifying to see, although it is just the first step in a campaign to have the No 19 Sydney Road tram service extended past it’s present Bakers Road, North Coburg terminus. This would add substantial amenity to residents in Fawkner and Hadfield in accessing a range of shopping centres, including the Campbellfield shops. 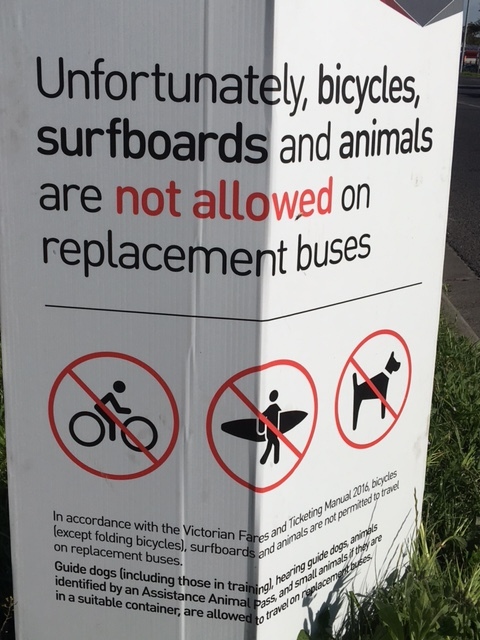 It would also add amenity to the various motels along Sydney road in Fawkner, encouraging their patrons to leave their cars parked and travel through Moreland by tram and train. I understand the the Victorian Government has brought forward 11 level crossing removals, two of which – Buckley Street in Essendon and Camp Road in Campbellfield – will be fast-tracked with work commencing next year and complete by 2019. 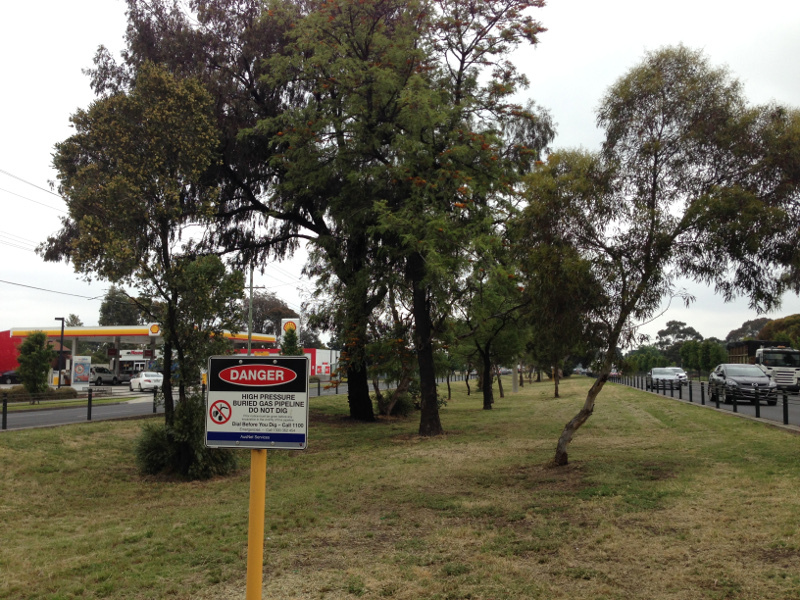 Camp Rd railway level crossing is just 300 metres along the road from the Campbellfield shopping centre. It is this Level Crossing upgrade which concerns me the most here. The 11 level crossings have been split into two packages with both now out to tender, according to this report in Urban Melbourne. My check of the Level Crossings removal website shows the Upfield line crossing removals as at 27 September, 2016 are currently under tender. The “North Western” package has five sites. As well as the two fast-tracked projects, the package includes Glenroy Road in Glenroy, Bell Street in Coburg and Moreland Road in Brunswick. The Upfield shared bike path parallels the Upfield railway line. It provides a relatively safe off-street bike path running down the spine of the municipality of Moreland. It connects people in Moreland with local schools, shops and businesses, and links with the Capital City trail in the south and routes into the Melbourne CBD. But the problem in the north is the gap connecting shared bike paths: the Upfield path stops at Box Forest Road and does not connect to the Western Ring Road Path that borders the northern boundary of the municipality. For those Fawkner residents wanting to shop by bicycle at Campbellfield there are presently two options: attempting to brave the horror of the Sydney Rd and Western Ring Road intersection, or the pedestrian bridge over the Western Ring Road a 100 metres east of this intersection. If you take the Pedestrian bridge, then once across Mahoney’s Rd at the Pedestrian lights there is a problem of lack of a path to cycle to the Campbellfield Plaza. Upgrading level crossings at Moreland Road, Bell Street and Camp Road is an opportunity to also clear bottlenecks and give priority to the increase in cycling in the municipality. The level crossing at Camp Road especially, needs to incorporate facility for cyclists to cross, and have the shared path extended down to Box Forest Road. This is important as the intersection of Sydney Road and Western Ring Road is simply not safe for cyclists to navigate across. VicRoads have provided no on-road or off-road facility for cycling through this intersection. 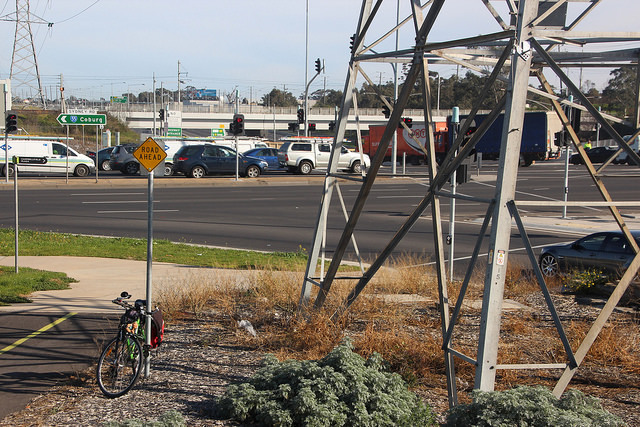 Extending the Upfield shared Bike path could connect with a path to the Campbellfield shops providing a safe route to cycle north for people from Hadfield and Fawkner and further afield. The railway bridge across the Western Ring Road was built with a capacity to take a second railway line and also with enough space for a shared path to extend the Upfield Bike path further north. But it is imperative that level crossing removal at Camp Street should also include works incorporating a cycle crossing. Now is also the time the State Government should join City of Moreland and City of Hume in extending the Upfield shared bike path at least up to Camp road with a vision of extending it further north and incorporate a short path to the Campbellfield shopping plaza. Providing off-road cycling facilities is a sure way to get more people cycling more often. It makes our communities more sustainable, and more climate friendly, while providing health benefits to individuals and society as a whole. Outer suburbs like Fawkner, Hadfield and Campbellfield need cycle friendly infrastructure just as much as inner suburbs. Indeed, because there is more of a culture built around roads and the car, it can be argued more cycling infrastructure might be needed in these suburbs to get people transitioning to lower emission transport and to change transport behaviours. There are other problems for cyclists from Fawkner, especially in the northern end around Anderson Rd, in finding a safe route to access the existing Upfield Path. These perhaps need to be considered in depth at Council and Vicroads level for resolution. For middle Fawkner the footpath on the western side of Sydney Rd next to the cenetery really needs to be declared a shared path, as Sydney Road has a speed limit of 70km per hour and is unsafe to cycle on, to access the Upfield path. So how about better bike facilities and extending the Upfield bike path further as part of the Camp Road Level Crossing Removal, Frank Maguire (Facebook), Member for Broadmeadows, and Lizzie Blandthorn (facebook), Member for Pascoe Vale? In recent weeks we have had a burst of activity in carpentry through collaboration with Urban Bush carpenters enabled by a grant from City of Moreland Council Celebrating Place program. We have had four workshops where people have been able to use carpentry tools to create some useful gardening furniture with assistance of the Urban Bush Carpenters. At the workshops we created a bench and five wicking planter boxes from old timber pallets. Of equal importance was the process of joining with others to build social community and community resilience. The planter boxes are located at the Fawkner Community House in CB Smith Reserve, on the nature strip on Jukes Road, and at the Community House new extension at 95 Major Road. 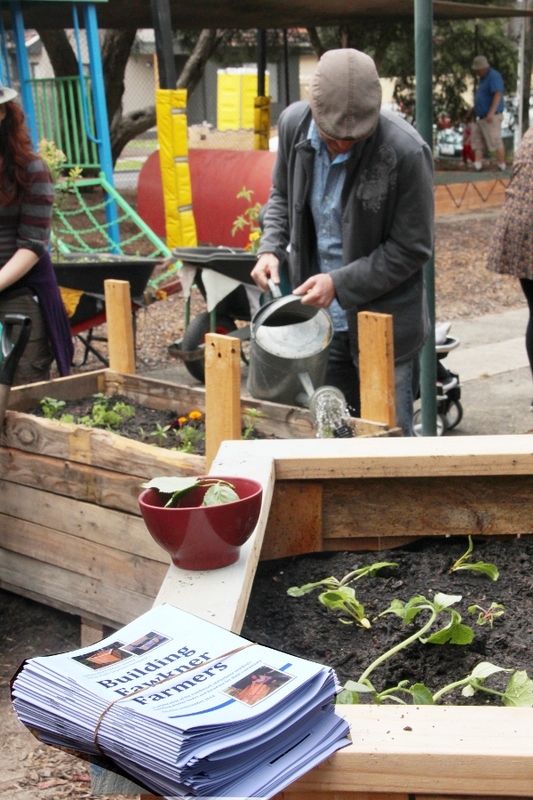 On Saturday we planted summer crops in the new community planter boxes and held a wheel barrow procession through Fawkner streets from one site to another. It was a merry procession with ukelele, singing and various percussion to the enjoyment of the several children as part of the event. We were joined at the planter box on Jukes Road by Cr Meghan Hopper, Mayor of Moreland, and Federal MP for Wills Kelvin Thomson. Cr Hopper joined in the planting. The Fawkner Women’s Choir sang two songs as part of the celebrations at Fawkner Community House. The way that we are going in terms of population increase and unsustainable practices means that there are real problems and challenges further on up the road. It is already true that many people around the world don’t have enough to eat on a day to day basis, but this problem is likely to get worse and to be exacerbated by the energy inputs and the amount of carbon required to transport food from where it’s grown to where it’s being consumed. The message out of all that is that we need to be more self-sufficient and to be able to grow and produce our own food. I think that is a terrific message to be conveying to people here in Fawkner as well as building all manner of living skills as part of that process. I am really delighted to seeing it in action. While there is some concern by government of aggregate impact of climate change on agriculture and food production, little attention has been paid to the fragility of food supply chains and the role urban agriculture could play in urban resilience for urban populations. This has resulted in the upsurge of the Transition towns movement, an increase in suburban farmers markets, backyard permaculture gardening and informal food swaps. Burton et al (2013) detail in a qualitative study the growing interest in urban food security and backyard permaculture utilising two case studies of the Gold Coast and Melbourne as examples. This study provides a window on local communities already responding to climate change by building more resilient communities. 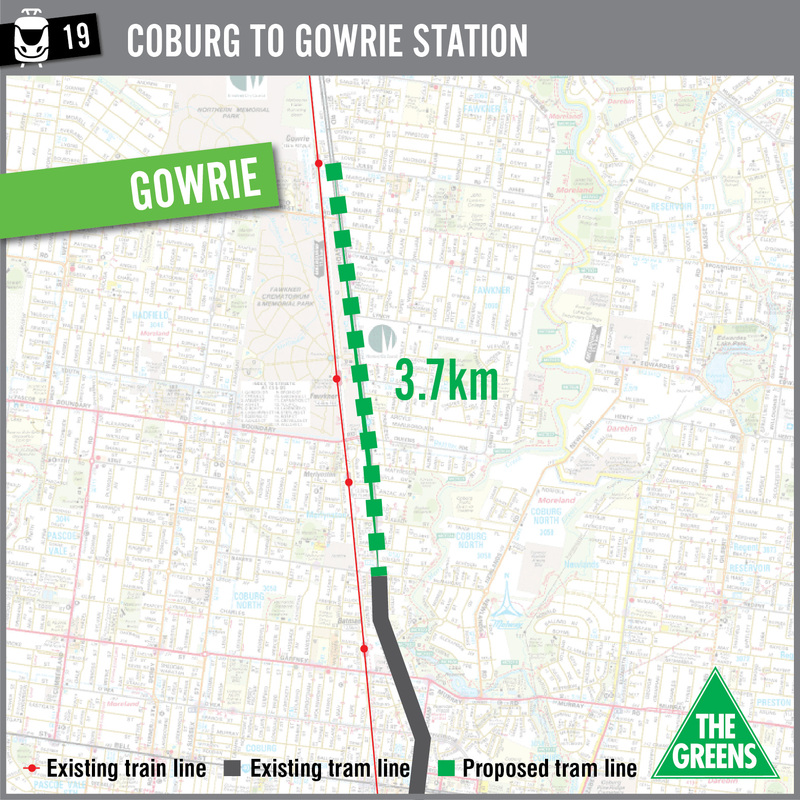 Extending the No 19 tramline to Gowrie Station in Fawkner has been proposed by the Greens this election. It is part of an initiative to fill missing tram links amounting to an extra 56 kilometres around Melbourne at a cost of about $840 million. Rather than trams terminating midway between focal points, it is suggested they be extended to meet train stations or shopping centres to improve their functionality and intermodal usefulness. The proposal for adding a number of tram extensions to the network is not new. The Public Transport Users Association have had plans for several years which they continue urging policymakers to adopt. The Greens proposal for 17 tram line extensions totalling an extra 56 kms was initially unveiled in July 2014. The Greens also advocate the purchase of another 50 locally built E-Class trams to also alleviate some of the pressure on Melbourne overcrowded trams, especially in the northern suburbs. The Greens cost the extensions at about $15 million per kilometre as against the cost of $1 billion per kilometre for East West Link. Some have raised ‘Can the Greens tram plan be taken seriously?‘ (Alan Davies, Crikey) yet public transport commentator Daniel Bowen argues that Tram extensions: Not as expensive as some claim. @danielbowen "DTF notes that efficiencies in the packaging and procurement works may reduce the (cost)" Yeah I reckon cheaper by the dozen. Other than the Route 19 tram, the Route 112 tram extension along Gilbert Road to Edwardes Lake Park, then up Edwardes street to terminate at Reservoir Station also makes a lot of sense to me enhancing intermodal connections. The other routes I’ll leave to others to discuss the merits of. You can read the Greens tram initiative, routes and maps yourself. What I want to talk about further is extending the No 19 tramline to, and perhaps past, Fawkner. The Greens proposal for Route 19 involves extending the tram track up the middle of Sydney Rd to Fawkner Shops (via Gowrie Station). The map seems to indicate it would terminate in the centre of the road near Gowrie Station rather than actually connect to the Fawkner shops in Bonwick street. Taking the tram tracks down Jukes Rd might be a little problematic. That strip of Sydney Road in Fawkner also features several motels catering to visitors to Melbourne, including the Meadow Inn Hotel-Motel, Hume Villa Motor Inn, Ibis Budget Fawkner, and the Fawkner Star Motel. A tram line on Sydney Road would encourage those visitors to leave their cars in motel car parks to catch the tram to Coburg, Brunswick or even into the city or to the Campbellfield shopping Centre. The population of Fawkner and Hadfield are also increasing with more medium density sub-development so the tram extension would also cater to this population growth. 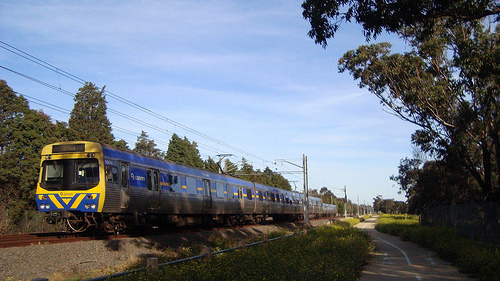 The railway Stations of Gowrie and Fawkner provide a wide catchment, with many people driving and a few cycling to these stations to commute to work. The Upfield rail line is already operating at near capacity during peak periods with an increased frequency on this rail line overdue. There is a case for duplication of the track to Craigieburn and electrification from Upfield to Craigieburn to close a loop and enable more freqent service. Greens candidate for Brunswick Tim Read suggested at the Moreland Transport forum that the duplication of the Upfield line past Gowrie and possible electrification of the existing track to Craigieburn would close a transport loop to Craigieburn and allow greater capacity and frequency of services on the Upfield Line. He was the only candidate at this forum to raise this potential. The extension of the Sydney Road tram to Campbellfield would make a real difference in alleviating pressure on the capacity of the rail service to meet peak demand, while increasing public transport patronage. Trams are especially efficient for smaller journeys and this tramline extension would help connect those living in Fawkner and Hadfield to other urban focal points in Campbellfield, Coburg and Brunswick. There are those who say this tramline duplicates the Upfield rail service, yet both services are popular and well used. It is likely any extension would increase public transport patronage. The Northern suburbs of Moreland could sure do with a little bit more public transport infrastructure. Australia is hosting the G20 and climate change is not on the agenda. Come along to a screening of ‘Reasons for Hope‘ film and a discussion to show that Australians want climate change #OnMyAgenda. Local resident John Englart will lead the discussion. Bring a plate of food to share. You’ll join friendly local people who care. Australian Prime Minister Tony Abbott was pushing for climate change to be off the agenda at the Brisbane G20 meeting at all. However the United States and France have exerted pressure and it will be listed as a minor item under Energy Efficiency. As climate change has been taken ‘off the main agenda’ by the Australian Government, the Australian Conservation Foundation is organising for people round Australia (and elsewhere) to put climate change #onmyagenda in self organised events and parties from November 12-15. Anyone can organise an event for their community. You can register your event here. John Englart, as a member of Sustainable Fawkner and Climate Action Moreland is holding an event called Climate change is #OnMyAgenda in Fawkner on November 15, 2014 at 6:00 PM at the Fawkner Community House. If you wish, you may also attend Sustainable Fawkner’s monthly meeting 4pm to 5.30pm, Come a little early to do a little bit of veggie gardening in our community garden. The #OnMyAgenda event will start about 6pm. All welcome. John is a member of Sustainable Fawkner, Climate Action Moreland and has been blogging on climate issues for over 10 years. Merri Creek forms an important parkland for the north-south length of Fawkner and Reservoir. It is also an important corridor for wildlife and for users of the Merri Creek Shared bike path which winds its way along the creek sometimes on the east and sometimes the west bank. The path uses the east bank of the creek behind the Department of Education site in Reservoir, where Lakeside Secondary College once stood. 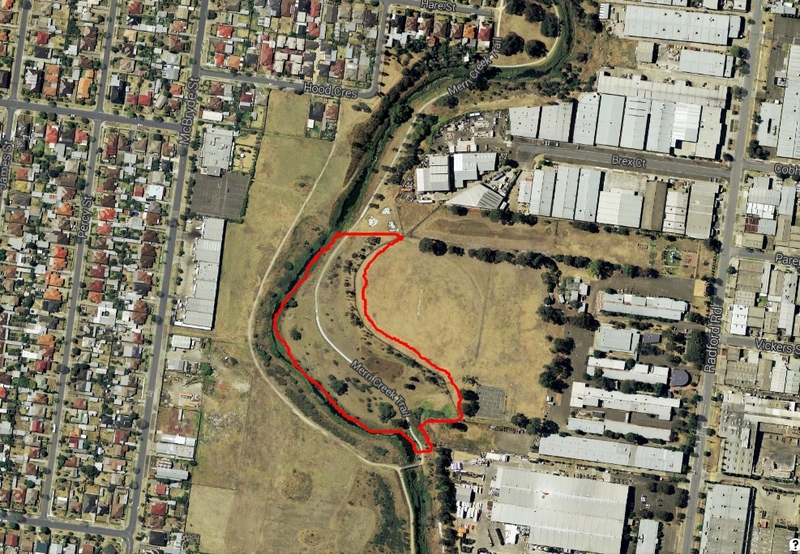 The title to the this site at 31 Radford St, Reservoir extends down to the creek verge. The Educational Department wants to sell the property and has requested the site to be rezoned for Industrial use. Several hectares of the site lie outside the school fence on a bend of the Creek and have been planted and managed for about 30 years by Darebin Council, as part of the Merri Creek open space corridor. If the creek frontage is sold without transfer of title to the Crown or Darebin Council, access to and use of the Merri Creek Shared pathway could be threatened. Interested in seeing the Bababi Djinanang grasslands in Fawkner and the native fauna and flora of the area? Come along to the next bird survey on Sunday 16 February, 8.45-10.30am. Bird surveys gather data which provides useful information for tracking bird species numbers and movements over several seasons. Beginners welcome. Bring drinking water, and binoculars if you have them. Closed-in footwear and a sunhat would also be useful. No dogs, please. Be aware that snakes could be around. In Fawkner: Bababi Djinanang (Jukes Road grasslands), Fawkner: Meet on Merri Path at end of Jukes Road, Fawkner (Melway 18 A2) at 8.45am. 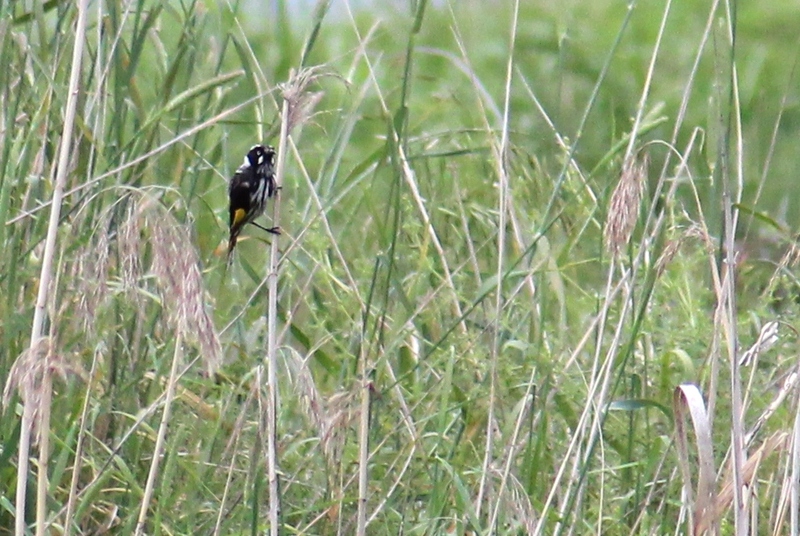 The bird suvey provides an opportunity to explore the fenced off area of Bababi Djinanang grasslands area, an opportunity to see some of the rarer grassland plant species and the birds that make this part of Merri Creek their home. In recent months there has been a small mob of kangaroos in the grasslands. Friends of Merri Creek run the bird survey on a quarterly basis up and down Merri Creek. How about visiting a part of the Merri that you haven’t seen? – choose a site from the list below. Bababi Djinanang (Jukes Road grasslands), Fawkner: Meet on Merri Path at end of Jukes Road, Fawkner (Melway 18 A2). Egan Reserve-Harding St-Strettle Reserve: Meet at the steps at end of The Grove, East Coburg (Melway 30 A3). Coburg Lake Reserve: Meet near the car park, Lake Grove Coburg (Melway 17 H10). Edwardes Lake: Meet at the playground adjacent to Griffiths St, Reservoir (Melway 18 E5). CERES to Moreland Road: Meet at the seats on the Merri Path at rear of CERES near Blyth Street, East Brunswick (Melway 30 B7). Phillips Reserve, Merri Park: Meet at the end of Victoria St, East Brunswick, at barbecue shelter (Melway 30 B8). Hall Reserve- Yarra Bend Park: Meet at the Rotunda, Hall Reserve, Clifton Hill (Melway 2D D1). Galada Tamboore: Meet at the end of Hatty Court, Campbellfield (Melway 7 K6). Galgi Ngaark (Craigieburn Grasslands): Meet at the O’Herns Road gate off Hume Highway (Melway 180 E6). Bababi Marning (Cooper St Grasslands): Meet outside the Istrian Social Club, Cooper St Epping (Melway 387K10). The survey at Bababi Marning will be a week later, on 23 February, 8.45-10.30am. In my travels around the internet I found this site put together by the Australian PV Institute showing the level of installation of solar photovoltaic panel installation by postcode or Local Government area. 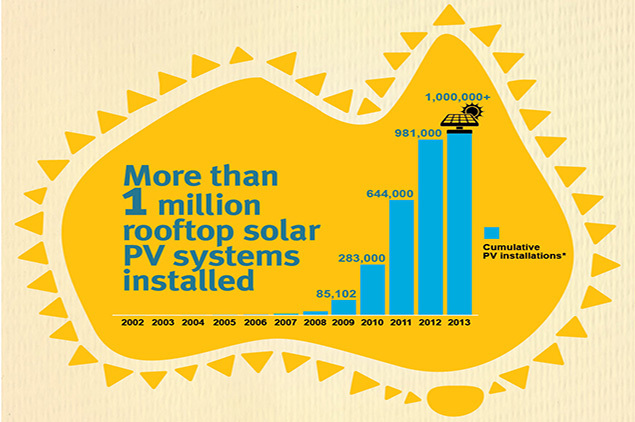 In Fawkner there have been about 246 solar PV installations. This amounts to approximately 5.4% of the estimated 4520 dwellings in our suburb with an installed capacity of 571kW. This is lower than the Moreland average of 6.1%. Moreland Local Government Area (LGA) and is also below other municipal areas in Melbourne’s north. Maribyrnong has 7% solar installation, Moonee Valley is on 6.5%, Darebin is on 6.9%, Banyule on 6.7%, Whittlesea on 9.7%, and Hume on 11%. We would like to acknowledge Fawkner Community House for ongong support; and aknowledge the Wurundjeri people as the traditional people who occupied Fawkner for many thousands of years.